Our lab is focussed on unravelling heterogeneity within the mononuclear phagocyte compartment in health and disease in terms of both phenotype and function in mice and men. To do this, we use state of the art techniques including single cell RNA sequencing and 28-parameter flow cytometry alongside MNP-subset specific in vivo mouse models including the Clec4F-Cre to target Kupffer cells in the liver, the Xcr1-Cre to target cDC1s and the Fcgr1-Cre to target all macrophages. The team is especially interested in understanding this heterogeneity in non-alcoholic fatty liver disease (NAFLD). NAFLD is currently one of the most significant clinical burdens in the western world and is thought to be the main reason for liver transplantation by 2030. Despite this there are no effective treatments currently available. As MNPs have been proposed to play a role in NAFLD progression we hypothesise that correctly identifying and distinguishing between these cell subsets and subsequently examining their specific functions will lead to a better understanding of this disease and may lead to new avenues for therapy. Scott CL*#, T’Jonck W*, Martens L, Todorov H, Sichien D, Soen B, Bonnardel J, De Prijck S Vandamme N, Cannoodt R, Saelens W, Vanneste B, Toussaint W, De Bleser P, Takahashi N, Vandanabeele P, Henri S, Pridans C, Hume D, Lambrecht B, De Baetselier P, Milling SWF, Van Ginderachter J, Malissen B, Berx G, Beschin A, Saeys Y and Guilliams M. ZEB2 is required to maintain the tissue-specific identities of macrophages. Immunity. 2018 49 (2): 312-325. Scott CL, Zheng F, De Baetselier P, Martens L, Saeys Y, De Prijck S, Lippens S, Abels C, Schoonooghe S, Raes G, Devoogdt N, Lambrecht BN, Beschin A and Guilliams M. Bone marrow derived monocytes give rise to self-renewing and fully differentiated Kupffer cells. Nature Communications. 2016. 7:10321. Scott CL*, Soen B*, Martens L, Skrypek N, Saelens W, Taminau J, Blancke G, Van Isterdael G, Huylebroeck D, Haigh J, Saeys Y, Guilliams M, Lambrecht BN, Berx G. The transcription factor Zeb2 regulates development of conventional and plasmacytoid DCs by repressing Id2. JEM. 2016. 213(6):897-911. Guilliams M*, Dutertre CA*, Scott CL*, McGovern N*, Sichien D*, Chakarov S, Van Gassen S, Chen J, Poidinger M, De Prijck S, Low I, Irac SE, Nurfarah Mattar C, Rizal Sumatoh H, Hui Ling Low G, Kit Chung TJ, Kok Hong Chan D, Kan Tan K, Lim Kiat Hon T, Fossum E, Bogen B, Choolani M, Kok Yen Chan J, Larbi A, Luche H, Henri S, Saeys Y, Newell EW, Lambrecht BN, Malissen B and Ginhoux F. Aligning dendritic cells across tissues and species through unsupervised high-dimensional analysis. Immunity. 2016. 45(3):669-684. Remmerie A and Scott CL. 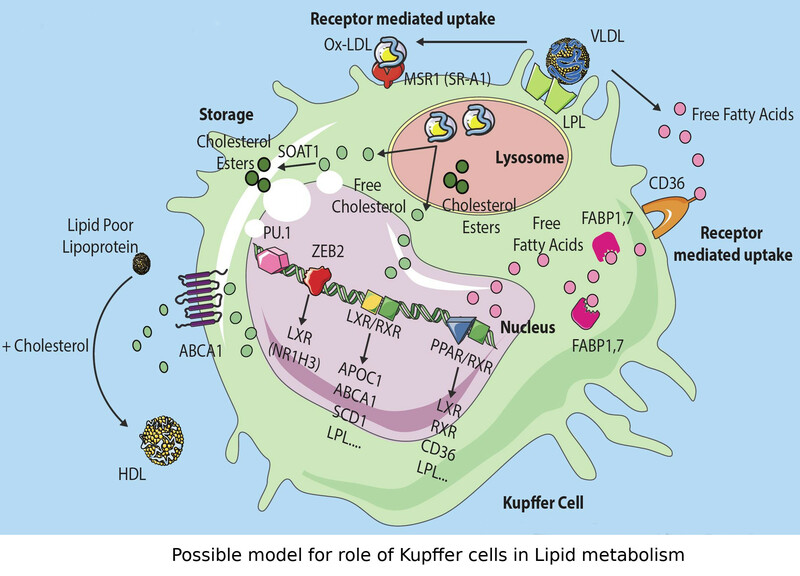 Macrophages in Lipid Metabolism. Cellular Immunology. 2018. 330:27-42.